Find out who will win today’s match? Welcome to crix11.com. In Today’s Dream11 Fantasy Cricket Prediction of CSK vs MI 27th T20 Match IPL 2018 we will cover expected playing 11, pitch report of Maharashtra Cricket Association Stadium, Pune, dream11 best team, what astrology has to say on the toss. We will also cover all the latest news and updates of today’s match, players recent and past performance, weather report of Pune, dream11 guru prediction, the best choice for captain and vice-captain, key players, where to watch the live match of MI vs CSK and live streaming details. Make sure to read the complete post as all the details and statistics are absolutely FREE. Try to play in small leagues to get 100% benefit. Where Can You Watch the Live Streaming of CSK vs MI or Channels to Watch? Who Will Win the 27th Match of IPL 2018 Between MI vs CSK and Toss Prediction? What is the best combination of players for Dream11 in 27th Match? Date: The match will be played on 28th April 2018 (Saturday). 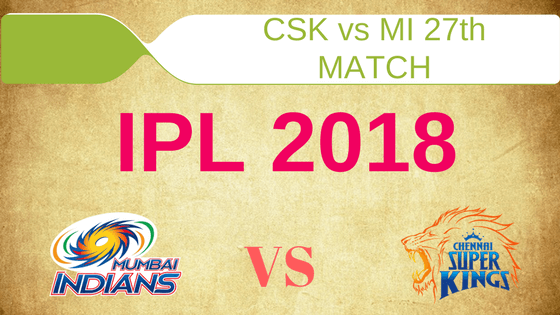 Match: Indian Premier League, MI vs CSK, IPL 2018. Maharashtra Cricket Association Stadium is known for its batting. In the last season of IPL, it helped the batsman and some of the spinners also got some grip. Bowlers like Imran Tahir were benefited the most. It will behave the same way in this IPL also. Dew will play an important factor on this ground. Overall the pitch will be a batting paradise. Highest total on this ground is 158/5 in 17.5 overs by IND v ENG. Lowest total on this ground is 101/10 in 18.5 overs by IND v SL. On Saturday morning, it will be a sunny day and at the time of the play, the sky will be clear. There is no sign of rain today. The temperature is expected to be 31-Degree Celsius and humidity to be 49% which may go up to 64%. In the last encounter against each other, CSK won the match in the last over. If we look at last five matches, Mumbai Indians won three matches out of five whereas Chennai Super Kings won 2 games out of 5 games. In overall encounters, there is a slight difference. MI won 12 times and CSK won 11 times. It will be interesting to see which team improves their record. Star Sports has paid a huge amount of INR 16,347.50 Crores to get exclusive rights of IPL 2018 for live coverage for five years starting from 2018 to 2022. Star Sports has all the media rights including TV and all Digital Rights. You can watch the full match of Mumbai Indians vs Chennai Super Kings on Star Sports. Shane Watson, Sam Billings, Ambati Rayudu, MS Dhoni (c & wk), Kshitiz Sharma, Suresh Raina, Harbhajan Singh, David Willey, Ravindra Jadeja, Imran Tahir, Dwayne Bravo, Mark Wood, Deepak Chahar, Faf du Plessis, N Jagadeesan, Shardul Thakur, Monu Kumar, Karn Sharma, Murali Vijay, Dhruv Shorey, KM Asif, Chaitanya Bishnoi, Kanishk Seth. Rohit Sharma (c), Ishan Kishan (wk), Siddhesh Lad, Kieron Pollard, Suryakumar Yadav, Hardik Pandya, Adam Milne, Evin Lewis, Anukul Roy, Krunal Pandya, Jasprit Bumrah, Mitchell McClenaghan, Tajinder Singh, Mayank Markande, Rahul Chahar, Akila Dananjaya, Mustafizur Rahman, Pradeep Sangwan, Saurabh Tiwary, Sharad Lumba, MD Nidheesh, Jean-Paul Duminy, Aditya Tare, Ben Cutting, Mohsin Khan. Chennai Super Kings played 6 and won 5, on the other hand, Mumbai Indians Played 6 and lost 5. This is a short story of both the teams. MI is at the bottom of the points table whereas CSK is at the top of the points table. Mumbai Indians need to change their playing 11 if they want to win today’s match. JP Duminy can be a good replacement for Pollard. It will be interesting to see how they make a combination in their lean phase. Evin Lewis, Suryakumar Yadav, Krunal Pandya, Jasprit Bumrah, Ishan Kishan (wk), Kieron Pollard/Jean-Paul Duminy, Rohit Sharma (capt), Mustafizur Rahman, Mitchell McClenaghan, Hardik Pandya, Mayank Markande. “If nothing is broken then why to fix”. CSK team has emerged as one of the strongest team in this IPL. Chennai Super Kings are most likely to play with the same playing 11. Dhoni may think of giving a chance to their bench players but not on today’s match. Suresh Raina, Shane Watson, Sam Billings, Ambati Rayudu, Harbhajan Singh/Karn Sharma, Imran Tahir, MS Dhoni (capt & wk), Deepak Chahar, Ravindra Jadeja, Shardul Thakur, Dwayne Bravo. MS Dhoni: In last 149 innings MS Dhoni has scored 3770 runs in IPL with an average of 38.87. His highest score is 79 runs. He contributed 56.5 points in the last match. 62.85% of the users have selected him in their teams. Ishan Kishan: In last 21 innings Ishan Kishan has scored 470 runs with an average of 22.38. His highest individual score in IPL is 61 runs. He contributed 14 points in the last game. 36.46% of the users have taken him in their dream11 teams. Pro tips: Both the players are good. You can make a combination of the above players for multiple teams. Rohit Sharma: Rohit Sharma scored 4347 runs in last 160 innings with an average of 32.2 runs. His individual highest score in IPL is 109 runs. He contributed 7 fantasy points in the last match. 61.42% of the users have selected him in their dream teams. Suresh Raina: In last 162 innings, Raina has scored 4669 runs with an average of 34.04. He contributed 8.5 points in the last match. His individual highest score in IPL is 100 runs. 67.5% of the users have picked him in their teams. Evin Lewis: In last 6 innings, Lewis scored 147 runs with an average of 24.5. His highest score in IPL is 65 runs. He contributed 5 points in the previous game. 50.14% of the users have taken him in their teams. Ambati Rayudu: Rayudu scored 2699 runs in his IPL Career with an average of 28.41. His individual highest score is 82 runs. He contributed 56.5 points in the last game. 90.1% of the users have selected him in their teams. Sam Billings: Sam Billings scored 303 runs in his short IPL career with an average of 21.64. His individual highest score in IPL is 56 runs. He contributed 15.5 points in the last inning. 20.04% of the users have selected him in their teams. Suryakumar Yadav: In last 48 innings, Suryakumar Yadav scored 838 runs with an average of 24.65. His individual highest score in IPL is 72 runs. He contributed 27 points in the last game. 80.57% of the users have taken him in their dream 11 fantasy teams. Pro tips: The above players are most likely to perform in today’s match, so make a combination of the above players. You can also take players from playing 11 for multiple teams. Shane Watson: Shane Watson has scored 2813 runs and took 92 wickets in his IPL career. His highest score in IPL is 106 runs. He contributed 4.5 points in the last inning. He scored three centuries in Indian Premier League. 75.44% of the users have selected him in their teams. Krunal Pandya: Krunal has scored 593 runs in his IPL career with an average of 31.21 and took 22 wickets. He contributed 16 points in the last match. His highest score in IPL is 86 runs and his best bowling figure is 14/3. 55.26% of the users have selected him in their teams. Hardik Pandya: In 38 innings, Hardik scored 454 runs with an average of 20.64. His highest score in IPL is 61 runs and his best bowling figure is 24/3. He contributed 28.5 points in the previous game. 42.81% of the users have taken him in their dream11 teams. Dwayne Bravo: In last 88 innings, Bravo scored 1380 runs with an average of 24.64. His highest score in Indian Premier League is 70 runs and his best bowling figure is 22/4. He contributed 38.5 Points in the last match. 72.12% of the users have selected him in their teams. Pro tips: You can make a combination of the above players for multiple teams. Jasprit Bumrah: In last 53 innings, Bumrah took 54 wickets and his best bowling figure is 7/3. He contributed 15.5 points in last game. 56.23% of the users have taken him in their dream teams. Mitchell McClenaghan: McClenaghan took 60 wickets in last 44 innings and his best bowling figure is 21/4. He contributed 22 fantasy points in the previous innings. 40.79% of the users have chosen him in their teams. Imran Tahir: Imran Tahir took 53 wickets in 37 innings. His best bowling figure is 28/4. He contributed 22 points in the previous match. 45.32% of the users have selected him in their teams. Mayank Markande: Mayank Markande, in his last 6 innings took 10 wickets. His highest bowling figure in Indian Premier League is 23/4. He contributed 23.5 points in last game. 68.2% of the users have chosen him in their teams. Deepak Chahar: Deepak Chahar took 7 wickets in last 11 innings. His best bowling figure in IPL is 15/3. He contributed 1 point in the last game. 39.77% of the users have taken him in their teams. Pro tips: The pitch will support the spinners more than seamers so try to take spinners in your teams. For multiple teams make a combination of the above players. Pro tips: The above players are most likely to perform. You can take the above players as a captain and vice-captain. You can also keep captain and vice-captain from key players. Chennai Super Kings has the strongest batting side in this season which makes CSK ahead of Mumbai Indians. On paper Dhoni’s lead team is strong and has the full chance of winning today’s match. According to our cricket expert prediction, CSK will win the 27th match of IPL 2018. The dew will play a very important role in this match, so the team winning the toss will love to bowl first. According to our astrology prediction, CSK will win the toss and they will invite MI to bat first. On Pune pitch, spinners can cause a serious damage so try to keep spinners in your winning teams. Dhoni, Rayudu, and Shane Watson are in good form. Try to keep them on your team. Pune ground is also known for high scores, so try to keep big hitters in your teams. Conclusion: This is it for Today’s Dream11 Fantasy Cricket Match Prediction of CSK vs MI, 27th T20 Match, IPL 2018 which will be played on Saturday 28th April. You can give your valuable feedback in the comment section. Subscribe to our notification of latest updates. GOODBYE!